Water found a low spot in this system. Water contamination is a frustrating problem with compressed air systems. When you have water forming in your piping system, it is amazing how the liquid can seemingly form in both high spots and low areas. Often water problems are caused by another issue, heat. Compressed air leaving a compressor may overload the system air dryers because the flow contains too much moisture. A rule of thumb states that for every 20° F increase in compressed air temperature, the air flow of air contains double the amount of water. When compressed air treatment systems, such as air dryers, are not properly sized for worst case scenario, and compressor discharge temperatures are abnormally high, the water vapor (and free water) can exceed the conditioning system’s ability to dry the air. When the dew point of the air exiting the air dryer exceeds the ambient temperature to which the compressed air pipes are exposed, problems develop. 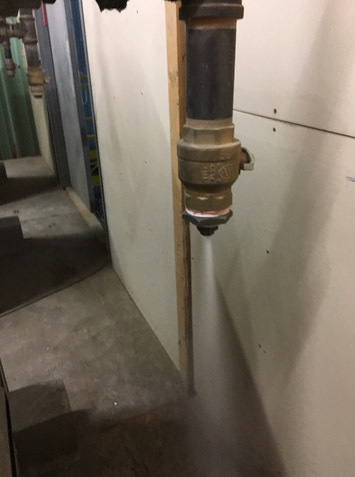 Air exiting an overloaded compressed air dryer at a dew point of 90° F will drop moisture into the pipes if the air is cooled below its dew point. In these cases, water can flow uphill, propelled in vapor form, only to deposit at compressed air system high points where ambient temperatures are cooler. And problems develop at low points as well, not only due to the cooling of the compressed air, but also due to gravity, water easily flows downhill. If your system dryer is overloaded and your pipes, for example, flow under your plant floor, the condensed water will flow to the lowest point in your system, and wait to be percolated up into your system during a high flow event, contaminating downstream equipment. Often there will be no method of draining the water from under floor systems. The solution is to properly size your compressed air drying system for worst case temperature conditions, sometimes requiring double or more of the normal of drying capacity. And, be sure to design your piping system for the inevitable failure of your air dryer, when moisture forms you need a way to remove it. Sloping the piping system away from the compressor room, and placing an energy efficient drain at every low spot can help ensure your end use equipment is not drowning in water.